[131 Pages Report] The concentrating solar power market was valued at USD 4.02 Billion in 2015, and is expected to grow at a CAGR of 10.3% from 2016 to 2021. Growing environmental concerns over carbon emissions and efforts to reduce air pollution, policy support from governments to enable adoption of renewable technologies and dispatchability of power are the major factors driving the concentrating solar power market. This research study involved the use of extensive secondary sources, directories, and databases such as Hoovers, Bloomberg Businessweek, Factiva, and OneSource to identify and collect information useful for a technical, market-oriented, and commercial study of the global concentrating solar power market. Primary sources are mainly industry experts from core and related industries, preferred suppliers, manufacturers, distributors, service providers, technology developers, standard and certification organizations of companies, and organizations related to all the segments of this industry’s value chain. The points given below explain the research methodology. The ecosystem of the global concentrating solar power market starts with suppliers of basic components/equipment such as reflectors/mirrors, receivers/engines, power block, and miscellaneous parts. The manufactured parts or sub-assemblies are then assembled by the EPC contractors authorized by the project developers to form a complete CSP plant. The top players in the industry market their products through self-operated sales offices located near target markets, while regional players rely on distribution partnerships to access diverse markets. Some of the major players in the concentrating solar power market are Abengoa Solar (Spain), Aalborg CSP (Denmark), ACWA Power (Saudi Arabia), BrightSource Energy, Inc. (U.S) and eSolar Inc (U.S), among others. The global concentrating solar power market is projected to grow at a CAGR of 10.3% from 2016 to 2021, to reach a market size of USD 10.96 Billion by 2021. The growth is attributed to growing environmental concerns over carbon emissions and efforts to reduce air pollution, policy support from governments to enable adoption of renewable technologies and dispatchability of power. 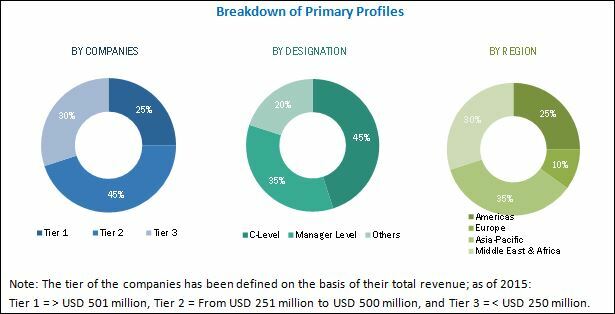 In this report, the concentrating solar power market has been analyzed with respect to five regions, namely, the North America, Europe, Asia-Pacific, South America and the Middle East & Africa. 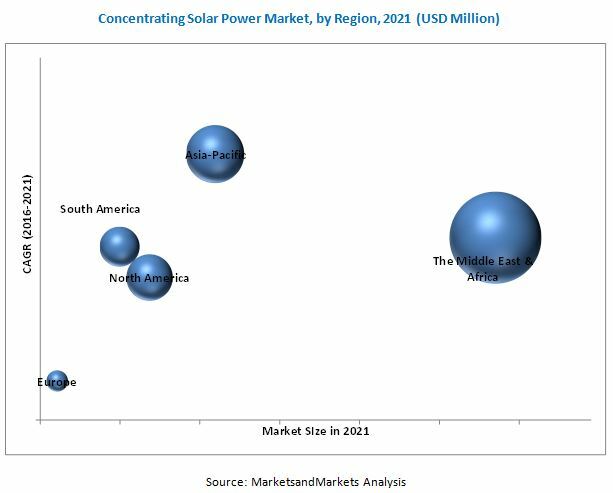 The Middle East & Africa is expected to dominate the global concentrating solar power market during the forecast period, owing to government initiatives towards grid scale renewable power generation. The region is expected to remain largest market among other regions, during the forecast period. Higher initial investment and higher payback time period are expected to slow down the demand for concentrating solar power during the forecast period. However, government and private fund availability may offer huge opportunities. Some of the leading players in the concentrating solar power market include Abengoa Solar (Spain), Aalborg CSP (Denmark), ACWA Power (Saudi Arabia), BrightSource Energy, Inc. (U.S) and eSolar Inc (U.S), among others. Contracts & agreements was the strategy most commonly adopted by the top players in the market, constituting 54% of the total developments from 2012 to 2016. It was followed by joint ventures & collaborations, new product developments/launches, expansions, partnerships, and mergers & acquisitions.